Unlike the Fighters, Bomber aircraft were flown by crews which spent the major part of their operational time over enemy territory flying through strong defences. Efficiency and teamwork, plus some luck, were vital to survival and success. My wartime experiences are inseparable from those of “OUR CREW” or “WE”. After normal basic training on Tiger Moths and Oxfords in 1940 and then a Hampden OCU, a posting to 455 RAAF Squadron followed in 1941. Soon I was teamed with two fellow Australians who had been trained under the ETS in Canada. Jack Leggo (later Sir Jack) a Navigator and Toby Foxlee a Wireless Operator/Air-Gunner, plus Sgt. 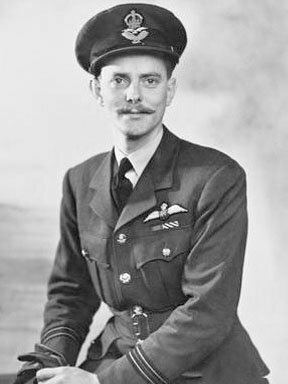 Tam Simpson of the UK, a rear Air Gunner. We started by laying mines off Borkum, then bombing sorties to Emden, Hamburg, Munster and Cologne. Next some mining, then an attack on the battleship Schamhorst at Kiel after flying through hail and lightning, with heavy ice on the wings and aerials, muting the radio. Navigation was by maps and dead-reckoning in cloud. After five more sorties to Ruhr targets, 455 RAAF Squadron was moved to Coastal Command but our ‘experienced crew’ remained in Bomber Command to convert to Lancasters with 50 Squadron. Conversion was via the Manchester and in one of these aircraft we took part in ‘Bomber’ Harris’s first 1000-bomber raids on Cologne, Essen and Bremen. That Manchester had no mid-upper turret so Toby Foxlee removed an escape hatch and sat on a swing with a K-Gun in the opening. Cologne was top priority and, for the first time, ‘Gee’, a new radar navigational aid, was available and visibility was good. Our crew had been increased to Manchester crew size by RAAF Sgts O’Neill and Smith. And so onto Lancasters with the original crew of four, plus two, for the originals to complete a first tour of 34 sorties. In March 1943 Wing Commander Guy Gibson asked if I would join him for a special task. Yes, if our original crew of four could be had. The later members had been lost. In late March we arrived at RAF Scampton to train for the Dams Raid and as replacements chose Bob Hay (Bomb Aimer) Van Whittaker (Engineer) Chambers (Radio). The ideal night was 16/17 May 1943. The order of attack on the Mohne Dam was Gibson’s crew first, Hopgood’s second, ourselves, Young’s, Maltby’s when the Dam crumbled and flood water rolled down the valley. Others breached the Eder and attacked other Dams. Eight of the nineteen crews were lost. The Guy Gibson VC book gives accurate details. In September the CO was killed leaving only five of the original crews. I was made Acting CO. In November Group Captain Leonard Cheshire became our new CO. The pattern of operations continued and we went on researching target marking techniques pending the arrival of Barnes Wallis’s “Earthquake Bombs”. In February orders came to attack the Antheor Railway Viaduct on the French Riviera. Leonard’s crew and ours were to mark for a small force carrying heavy bombs. Leonard’s aircraft was caught by searchlights and bursting flak well above which allowed us to slip inland and dive down a valley to cross the Viaduct at 50 feet. A moment before releasing the 12,000 lb bomb, a German shell hit the nose and killed Bob Hay and severed all the bomb release wiring. Whittaker was wounded in the legs. Only Simpson’s and Foxlee’s accurate return fire shot us free to emergency land later in Sardinia. At the AOC’s command that was our last Lancaster raid. I applied for a transfer to fighters but Sir Arthur Harris replied “there is only one way out of Bomber Command” but agreed a posting to 515 Night Intruder Squadron. They flew the Mosquito Mk VI fitted with 4 x 20mm canon and 4 x .303 Browning MGs. Intruding meant patrolling around German night fighter airfields looking for aircraft landing or taking-off. Airfield facilities were strafed, also supply routes, flak positions and diversions created for our bombers. My navigator was F/O Smith. Most of the last 9 months of the war were spent as a planner at 100 Group which intercepted enemy ground/air radio/radar signals and evolved jammers to negate them. I retired as an Air Marshal in 1974 after a rewarding life. 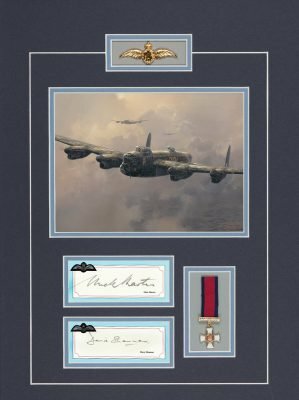 I could not have served on four better nor more closely knit Squadrons but because of Barnes Wallis’s Bouncing Bomb, and his huge Earthquake Bombs being assigned to 617 Squadron later, my prime affinity is to that Squadron. Wallis’s unique weapons brought with them needs to develop delivery and aiming accuracies never previously attained. The crews were normally very experienced before joining the Squadron, and inordinately dedicated. Choosing a favourite is very difficult when there are two such strong contenders. The Mosquito was a great pleasure to fly, being so manoevrable, fast and versatile, but I think the aircraft in which we achieved most was the Lancaster. On my eighteenth birthday in May 1940, itching to get away from my job as an insurance clerk and into the fray, I presented myself to the RAAF recruitment centre in Adelaide, was passed A1 fit and told to await call up for Aircrew training. This soon came and I was posted to Western Australia. My initial training was at Pearce, Western Australia, Elementary Flying Training in Tiger Moths from where I went solo after 11 hours. Service Flying Training in Avro Ansons was done at Geraldton. My authority to wear a Pilot’s Flying Badge was granted on the 24th July 1941 and qualification as a Service Pilot on 19th September 1941. Then to Embarkation Depot for kitting out as a Pilot Officer and on to England, via the USA and Canada. Training continued after arrival in the U.K. with Advanced and Blind Approach Training courses at Cranwell and Swanton Morley on Airspeed Oxfords, followed by O.T.U. at Kinloss in Scotland in Whitleys. During my first solo night flight in Whitleys doing circuits and bumps an engine cut at 200 feet just after take off. A great wide right hand circuit was made back to the runway for the single engined landing. The comment from my flying instructor back in the crew room was “… we never expected to see you back here, coffins don’t fly so well on one engine …!” From Kinloss I went to Heavy Conversion Unit at Wigsley in Lincolnshire and passed out on Manchesters and Lancasters. Finally to operations with 106 Squadron, Conningsby commanded by Guy Gibson where I arrived in June 1942. My first operational flight was to Bremen on one of the early 1000 Bomber Raids. During my time with 106 Squadron at Conningsby and later, Syerston, I took part in some of the first low- level daylight raids on Danzig, Essen, Le Cruesot and Milan, flying Lancasters. I continued to serve in 5 Group Bomber Command completing 3 operational tours with Nos. 106 and 617 Squadrons, being continuously operational from June 1942 until July 1944 when I was forced to take a break by the A.O.C. 5 Group, The Hon. Sir Ralph Cochrane. A special tribute is due to the crew members who flew with me particularly my navigator Danny Walker of the R.C.A.F. “While engaged on a low level bombing exercise in a Lancaster Aircraft the aileron control cable broke. In spite of this severe handicap, S/Ldr. Shannon maintained control of the aircraft, returned to base, and displaying exceptional flying skill, made a perfect landing“. G/Cpt. Philpott, Station Cmdr. After an extended tour with 106 Squadron under Guy Gibson I volunteered for Pathfinders, was accepted, but hadn’t been there for 48 hours when Gibson called asking if I would rejoin him. I accepted immediately, proud to be selected as a founder member of 617 Squadron, and to be serving again under one of Bomber Command’s finest Squadron Commanders. Morale under Guy Gibson was always of the highest order and this continued when Leonard Cheshire took over the Squadron later on. I completed a further two tours with 617 flying Lancasters and Mosquitos. I became a Flight Commander when Cheshire took over the Squadron in October 1943. I later served as a Wing Commander at the Australian OTU at Church Broughton from July 1944. After only three months I dropped rank to fly Yorks and Liberators on the trunk routes with Nos. 511 and 246 Squadrons in Transport Command until my demobilisation in December 1945. After the war ended I joined The Royal Dutch Shell Group as a Management Trainee and after four years in Borneo from 1946-50 served in Venezuela, Egypt, London (on North African affairs), Colombia and Kenya. I stayed in the oil business until my retirement in 1984. On my third tour I flew Mosquitos and found them a delightful aeroplane, however, most of my operational flying was in Lancasters. This was a magnificent machine, always capable of being up rated for power, bomb load, and in the case of the Dams Raid, withstood the special modifications required to carry Barnes Wallis’s Spinning Bomb. A really remarkable and versatile aeroplane, sweet to fly with no hidden vices.